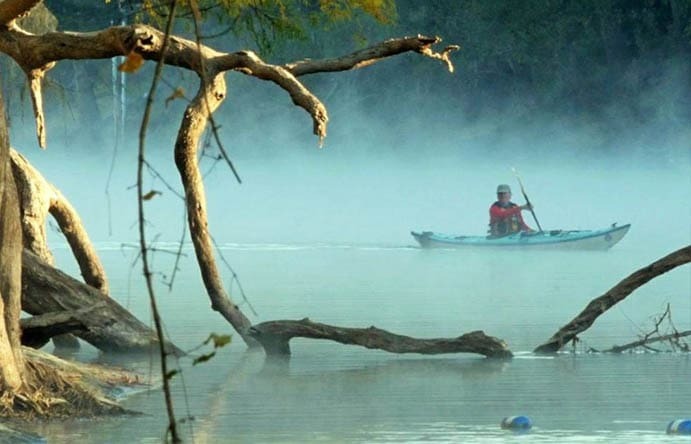 Gainesville, Florida Paddle Florida: Inspiring. Meaningful. Adventure. Paddle Florida, Inc. is a not-for-profit 501(c)(3) corporation organized to support canoeing and kayaking in Florida. Supported, multi-day paddling/camping adventures in each of Florida's five water management districts showcase the state's natural beauty and rich cultural heritage while promoting water conservation, wildlife preservation, springs restoration, and waterways protection. Paddle Florida also seeks to promote Florida as an international destination for nature-based tourism. 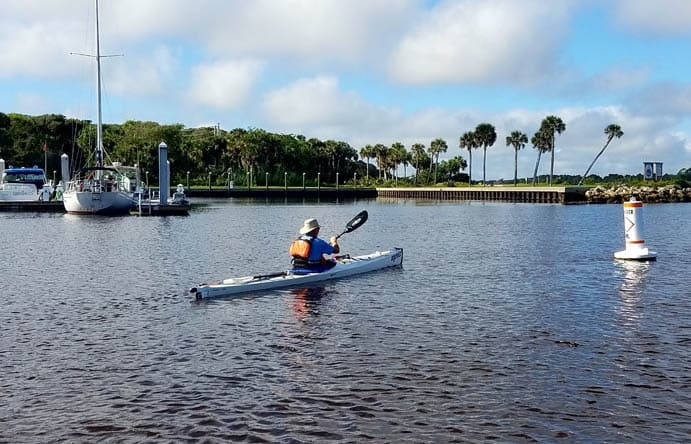 Paddle Florida scouts trips in advance to ensure waterway conditions and shoreline campsites are safe, comfortable, and showcase nature's best view. Meal plans and gear shuttling eliminate the need to weigh down boats with food and camping equipment. Florida-based entertainment and educational programming is provided each evening by regional artists, musicians, authors, and naturalists. Partnerships with local outfitters provide paddlers with canoes, kayaks, and other paddling gear to rent as needed. With this level of support, paddlers of all ages and skill levels can explore and enjoy the REAL Florida! 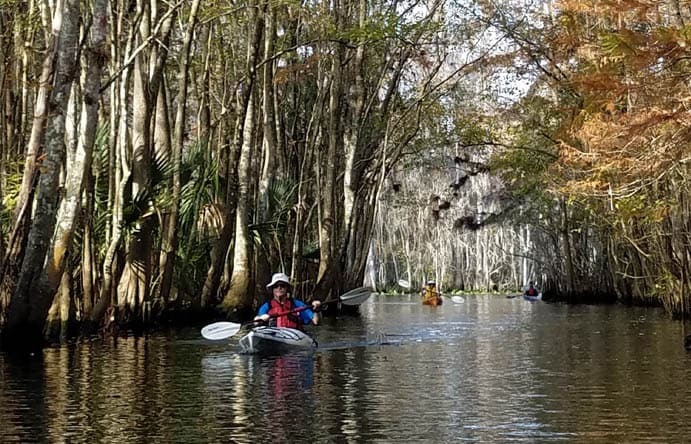 Take a peek at a couple of our most popular paddling adventures on North Florida's famous Suwannee River and in the Florida Keys. Paddle Florida is proud to be Silver Level certified by the Florida Society for Ethical Ecotourism. Florida SEE encourages awareness and stewardship of Florida's natural and cultural heritage by endorsing compliance with federal, state, and local laws, providing environmental education, and promoting professionalism and integrity. Refund Policy: Due to the financial outlay and costs incurred by Paddle Florida during event planning, any force majeure, which includes but is not limited to water levels, inclement weather and any other Acts of God not mentioned herein, shall not result in the refund of any fees paid to Paddle Florida. Absolutely no fees will be refunded after 15 days before the event begins. Any fees refunded by Paddle Florida will be considered on a case-by-case basis. (05/31/2018) Where are you from? Your profession? I live in the Kansas City area, and also lived in Dallas for many years. I work as a consultant to very small businesses who do not have internal marketing, promotions, and business support services. When and how did you become interested in paddling? I first tried paddling at an event with a local women's outdoor group about eight years ago. I loved it immediately, bought a recreational kayak, and have been paddling regularly since then. I founded Paddle KC kayak and SUP paddling club in January of 2015 after several years of hosting paddling outings in the Kansas City area. The focus of Paddle KC is to get together on the water to enjoy paddling experiences, increase paddling skills, and grow connections with other kayaking, paddleboarding, and canoeing enthusiasts who own their gear and are ready to go. Too many people paddle alone, learn things the hard way (like I did when starting out! ), and are unaware of important safety considerations for paddleboarding or kayaking. Joining Paddle KC helps new and experienced paddlers enjoy this fantastic hobby more. I learned of Paddle Florida from one of our members who goes on Paddle Florida trips every year. Where is your favorite place to paddle? I have many favorites, for many different reasons. Most of all, I just love exploring throughout the year. I visit many Missouri and Kansas lakes and rivers near Kansas City. I look for areas of lakes with lots of inlets and feeder creeks for great views of wildlife and protection from possible winds. The Missouri River at Kansas City is an interesting "big river" experience, with iconic views of the downtown skyline and the underside of familiar bridges. The Current River, Jacks Fork River, and Eleven Point River are all beautiful Missouri Ozarks rivers with mild but fun Class I & II rapids. One of my all-time favorites that I visit every year is the spectacular Buffalo National River in Arkansas, with 500-foot cliffs, cold-water springs, waterfalls, rolling hills along the river, and plenty of sandbars for kayak camping. Last New Year's Eve, I really enjoyed paddling the Current River. It was 8 degrees and the river was beautiful, with steam rising off the river and giant icicles hanging from steep rock cliffs along the banks. I ended up with icicles on my paddle and cockpit edges. What's the most interesting thing that ever happened to you on a paddling trip? I host an annual visit to a 150-acre underground lake in a flooded mining cave that operated from late 1800s to 1950s. That whole experience is interesting. We camp in a giant cave with 30-40 friends, paddle the underground lake in total darkness except for our headlamps and a couple of spots with holes to the sky, and do a scavenger hunt by headlamp in kayaks to find prizes bobbing in dark corners. Last time, the cave guide led me into a "squeeze box" where I had to scoot down into my kayak and turn my head sideways to avoid hitting my head. You know it's tight quarters when you are squeezed down as much as possible, with head turned to the side, and you scrape your cheek on the cave ceiling! It's a very cool, unique experience to paddle underground. (Don't ever try this alone in caves, by the way... go with an experienced guide who knows every inch of the cave and is certified in safety and rescue.) Which Paddle Florida trip(s) have you gone on? Wild and Wonderful Withlacoochee, 2018. Fantastic experience! This was my first experience on a trip with gear transport, provided meals, and evening entertainment and it added SO much. Can you describe a Paddle Florida trip highlight? I loved every bit of it! The varied scenery and wildlife along the Withlacoochee, the great shared meals, the interesting and entertaining nightly entertainment, and the cool people. I really enjoyed paddling the creek area with fallen trees that required climbing over from boats in the water. And the rainbow over our camp at the final campsite was a nice touch! What advice do you have for folks considering a Paddle Florida trip? Just Do It. You'll be glad you did. (04/26/2018) Where are you from? Your profession? I am originally from Riverton, New Jersey, just across the Delaware River from Philadelphia. I was a general contractor in Brigantine (one island north of Atlantic City) as well as the owner of Brigantine Sailboards, until my wife and I moved to Florida in 1990. I currently live in Fort Myers. My wife died 10 years ago. When and how did you become interested in paddling? I grew up racing sailboats on the Delaware from about age 8 on. My friend had a lake in his backyard and I learned to paddle a canoe at the age of 5. We spent a lot of time chasing turtles and fish in canoes and got very good at paddling. The town that I grew up in had a world famous boat building company that built wooden racing sailboats (Lippincott Boatworks). My brother and I built our first boat at age 10. I have been building boats ever since. After moving to Florida, I helped a friend build a Chesapeake Light Craft kayak and decided to build one for myself. My wife wanted one also and to date I think I’ve built eight kayaks. Where is your favorite place to paddle? 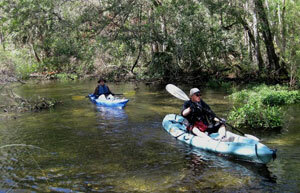 We usually paddle in the mangroves of the Calusa Blueway and the small rivers in the area. Also down in the 10,000 Islands area. I think that my favorite river is the short Silver River at Silver Springs. It is beautiful, clear, and has monkeys! What's the most interesting thing that ever happened to you on a paddling trip? I enjoy being lifted out of the water by manatees as they surface for air. I have had it happen often. The most recent incident was on the Loxahatchee over near Johnathan Dickinson State Park on the east coast. Which Paddle Florida trips have you taken? I have been on this year’s Choctawhatchee Challenge and last year's Dam to the Bay trip on the Ochlocknee River. Can you describe a Paddle Florida trip highlight? I prefer the narrower rivers, so my highlight would be seeing the environment along the Ochlocknee River. What advice do you have for folks considering a Paddle Florida trip? Based on our recent Choctawhatchee trip, my advice is to start with one of the easier trips to see if you have the skills to handle more challenging waterways. Paddling on lakes or without current is not the same as a 5-knot current with hairpin river bends! (03/29/2018) Where are you from? Your profession? I am a Jacksonville native and professional fine artist specializing in large scale watercolors of our state’s natural surroundings. When and how did you become interested in paddling? I come from a “water family.” Growing up, we spent time together canoeing, water skiing, swimming, fishing, sailing and windsurfing. Now my two brothers and I share our family lake house on Little Lake Santa Fe where we have lots of water toys, kayaks, paddle boards, canoes, and sailboats. My kayaking interest was sparked in college while going on whitewater rivers in Georgia and North Carolina. After graduation, I bartered a painting for my very first kayak - one for the flat waters of Florida, though, not whitewater. I’ve collected four kayaks now and my favorite is a sit-on-top that has a flat foot area where my golden retriever, Tanner, can comfortably ride with me. He adds to the enjoyment and adventure of any paddle. Where is your favorite place to paddle? I always enjoy canoe camping on the St. Marys River. Pulling over onto a random wide sand bar to camp overnight is pretty awesome. I also love the beauty of the Silver River and have painted several paintings from paddling trips there. The Santa Fe and Suwannee Rivers are always fun too. From my neighborhood I have several access points to the St. Johns River and Ortega River, so that is always fun. The Jacksonville area has a lot of nice places to paddle in fresh, brackish, and salt water. So, I guess I don't have one favorite. I just really enjoy being on the water and exploring new areas. Tell us about your book and art project which features North Florida parks and waterways. In 2017 I published a book The Wilderness of North Florida’s Parks, which is a unique blend of art, education, history, and community. It has 19 of my large scale landscape paintings of our area’s extensive park system and 60 parks are featured with sketchbook journal page entries about them. I designed it to be a resource, guide, and handbook, as well as a tribute to the great unspoiled stretches of my region. There’s a corresponding traveling art exhibit of the project to inspire people to visit these special places. I intend to continue painting more Florida landscapes, and trips with Paddle Florida are a great way to research new subject matter. Maybe another book and exhibit will come soon…. What's the most interesting thing that ever happened to you on a paddling trip? No thrilling story to tell, but what keeps bringing me back to the water for a paddle is just getting outside, spotting wildlife, and discovering the next painting to paint. Can you describe a Paddle Florida trip highlight? It might not sound like a highlight, but on my first and only (so far) Paddle Florida trip on the Withlacoochee River it was unseasonably cold for several nights. I now know I can camp in weather as cold as 27 degrees! Brrrr!!! I was nervous about the temperature drop but came prepared with lots of warm layers and a warm sleeping bag. I gained a new found appreciation for those activated charcoal hand, foot, and body warmers. Don't skimp on bringing those little but helpful heat generators. Fortunately, the days were perfect for kayaking. What advice do you have for folks considering a Paddle Florida trip? If you’re concerned about safety on these trips, be assured the volunteer guides who lead each day’s paddle are impressive. 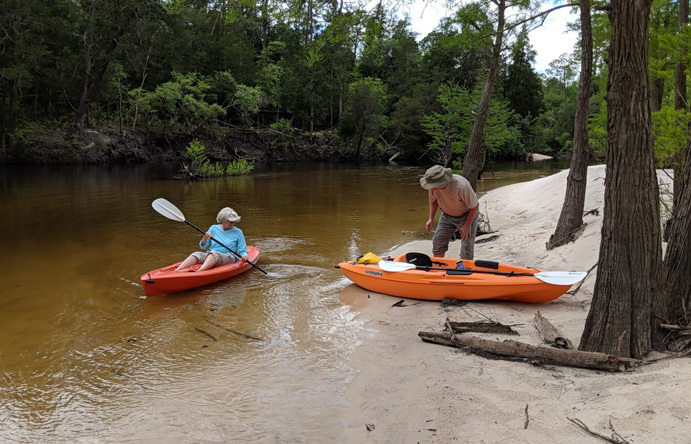 On the Withlacoochee trip, they “MacGyvered” a patch for a hole punched into a kayak, helped people make it over or around tree falls, and expertly helped someone get back in their boat when they tipped over in open water. And best of all, they knew where they were going on the river! Companies that Recommend Paddle Florida, Inc.